Scooter is all tired out and ready for a nice Memorial Weekend. The weather has been unusually cold for May. We have gone through an entire row of firewood, not the normal. Usually by May we are done with the firewood burning. We had a frost this morning again at 30 degrees and the hummingbirds are not happy about the chilly mornings. It does promise to get into the 60's over the weekend and maybe into the 70's Monday. The only plus of the cold weather has been a lack of bugs. I hope they don't return with the warm. Looks like I will be working most of the weekend in preparation for a week off when my family comes up the first weekend in June. I have heard many people saying they are making fewer trips to camp this year and trying to make them longer when they do come because of gas prices. It is yet to be seen what this summer will bring to the local business owners with what is promising to be a tight year. To all the Veterans out there I would like to shout out a special thanks for your service and make this an opportunity to visit places which honor our Veterans. Walking to the plane crash site is always a good way to make a special tribute to the World War 2 pilot who died there. You can look it up in key words for this site by going to p47. Mountain girl, Paula, logging out. Bobcat camp. It uprooted and is poised to take the power lines down across the road. Only a few trees are bracing it. This is not a cutting job for amateurs. 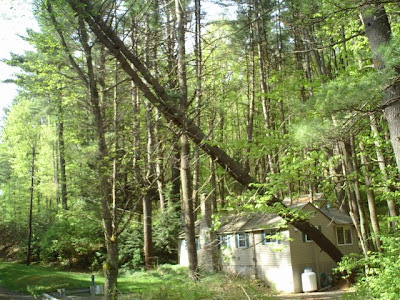 The cabin was spared by the tree deciding to make a less destructive exit. It is a rainy day today and I am off to work. Mountain girl, Paula, logging off. The apple tree in the front yard announced Mother's Day with a brilliant white shout. The trees are blooming and the allergies to trees are in full-swing so if you have any tree allergy bring your medicine. We have had a little cold, wet spell and are still having an evening fire to take the dampness out of the air. 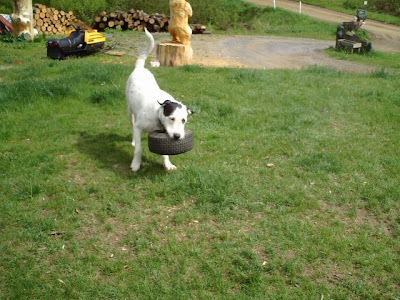 It seems we have been very busy with work and I have had little time to write anything on the blog. The turkey hunters have been stalking the woods with varying degrees of success. Of course the turkey's appear the most on Sunday just to spite the hunters. Last night I was at the Ruins camp and as I got ready to leave a large Black bear stood about 10' from the door. I decided to wait until he ate the hamburger one of the guys had thrown out...no wonder he was so close. This camp was like the McDonalds of the woods. I will try and take my camera with and get a few pictures for the next post. Have a great Leetonia Day. Mountain girl, Paula, logging out. Here is the view from the top of our hill as you can see the trees are starting to leaf out. There is still a long way to go before the forest again turns dark green and shrouds the mountain floor from our eyes. All of the small plants are blooming the wild strawberries and the wild blueberries or huckleberries. I have many large patches of huckleberries on the side of my hill and when they are bearing well they are a pleasant summer treat. Of course we have to share them with the birds and the bears, but that is part of living in the mountains of Leetonia. Today started with a cold 27 degree frost, but the sun is promising to warm up into the 60's. 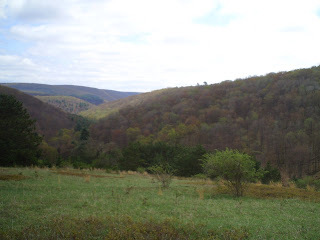 I am off to work at a cabin near Cedar Run and will enjoy the peace of the woods interrupted only by my sawing. Have a great Leetonia day! Mountain girl, Paula, logging out. The following pictures were all taken on Leetonia Rd. not far from the Elk Township Building. Last Saturday during a thunderstorm a micro-burst or something took out this area of trees in about a 400' circle. Most of the damage was on one side of the road. The second picture shows the damage to the other side of the road. for fun. Life is never boring in Leetonia. Mountain girl, Paula, Logging out. The day started at 23 degrees and frost on the snowmobile. It is cold for May although the weatherman promises it to get into the 50's today the sun is going to have to do some heavy duty warming. We have had a fire in the stove for the last three nights and woke up to a chilly 58 degrees in the cabin this morning. I have been busy working, which is good, but doesn't allow a lot of time for writing you all. The valley is perking up after a long winter. 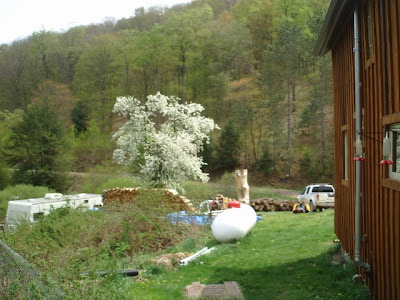 Campers are returning and camps are being repaired and remodeled so I have work and can restore my low cash reserves. 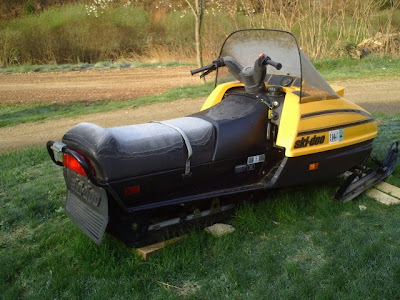 Oh, by the way I am selling this snowmobile for $500 if anyone is interested. The mountain girl needs some money after a tough winter. Now that they plow the road, I only need one snowmobile and decided to keep the larger one. Mountain girl, Paula, logging out.